Specializing solely on healthcare real estate (HRE), the group has principal involvement unmatched by any other HRE firm in the Upper Midwest. While preserving sensitive and confidential client information, Davis provides the most accurate and powerful statistical analysis for users and investors of HRE in the market. 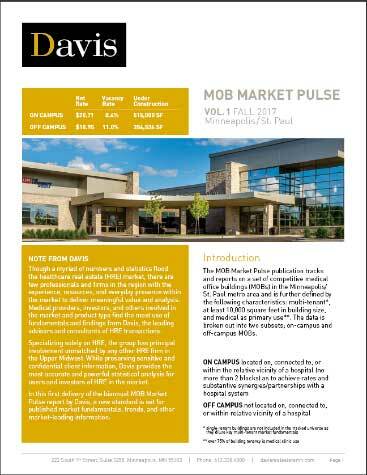 Keep up with the latest city profiles detailing current demographics and healthcare trends and development. Get the highly sought-after market report for the Minneapolis/St. Paul medical office building (MOB) market. Please simply fill out the form below for a sample report to receive a copy of the file.